Joshua Hedley on fiddle and Bryn Davies on upright bass made up Earle’s band, but they were more than just background accompaniment. Both were ample, if silent, sidekicks. Davies in particular impressed me; I don’t know if I’ve ever seen anyone play the bass with quite so much gusto before. The show belonged to Earle, though, and he made the entire affair seem a bit like a party. Earle is loud and enthusiastic, a charming Southern boy to the very core, with more “well, shiiiit“s and “oh my damn!”s than you could possibly count. His guitar playing is fast and hard, leading him to break a string early in the set. Earle’s been saddled with a name full of tradition and promise, and he lives up to both of his namesakes (father Steve Earle, and the legendary Townes Van Zandt). Indeed, watching him perform, you get the feeling that you’re watching someone who was destined for greatness. You’d hardly know that Earle is just 28, if you weren’t looking at him. Like an old school performer, Earle paused between nearly every song to introduce the next one or to chat with the crowd. Earle’s slower songs entranced the audience, giving them pause for just a few minutes, before he launched into another blistering song. Song selections included “Midnight at the Movies”, “What I Mean to You”, “They Killed John Henry”, “Mama’s Eyes”, “Poor Fool”, “Someday I’ll Be Forgiven For This”, and a few new songs, including one with a working title (according to the internet) of “Woman, You’ve Been Sleeping in the Middle of the Bed Too Long”, and “Workin’ for the MTA”, which was inspired by, who else?, an MTA conductor with a thick Louisiana accent. 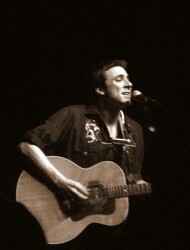 Now, I’ll admit that prior to this show, I’d only heard maybe one or two Joe Pug songs. I’d heard his name, of course, as he is widely acclaimed in the music scene here in Chicago. I’ve got no real reason for not searching him out earlier, given that his style of music is right up my alley. Well, consider myself properly chastised for not making that effort, because I was hooked from the very first song. While the comparisons between Pug and Bob Dylan are kind of inevitable — young, gravelly-voiced singer-songwriters crafting highly literate songs — I found myself reminded of a few other men with guitars and harmonicas: Bruce Springsteen and Neil Young. Regardless of which classic artist you choose to compare Pug to, the bottom line is that those are big shoes to fill, and I’m pretty sure that Pug is capable of doing just that. Performing both solo and with a band, Pug looked like a man having the night of his life. And really, why shouldn’t he? 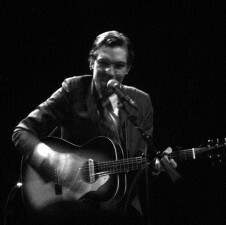 He was celebrating the release of his first full-length album, performing in front of a sold-out crowd in his adopted hometown (originally from North Carolina, Pug picked up and moved to Chicago to pursue his musical dreams), and having Justin Townes Earle, an able showman himself, open for him. While Pug has just a short discography behind him already, he headlined this show like a man with a lifetime’s worth of albums. Many of the songs were from Messenger, his newly released album. Some of the songs simply gave me chills, but one of the most poignant of the night was “Bury Me Far (From My Uniform)”, an anti-war anthem as much as it is an eulogy. “Do not bother with Congress, with the rich or with the rest,” Pug sings, “I fought their battles in this world, but I’ll not fight for them in the next.” A haunting, gorgeous song, one that’s stuck with me long after the show ended and I trudged back out into the noisy Chicago streets. See my photos from the evening here at Flickr.